over the thanksgiving weekend i went camping with my family. on the way home today, my alternator wasn't charging if i went over 65mph or so. luckily, i was only 1.5 hours from home. i made it home just fine. 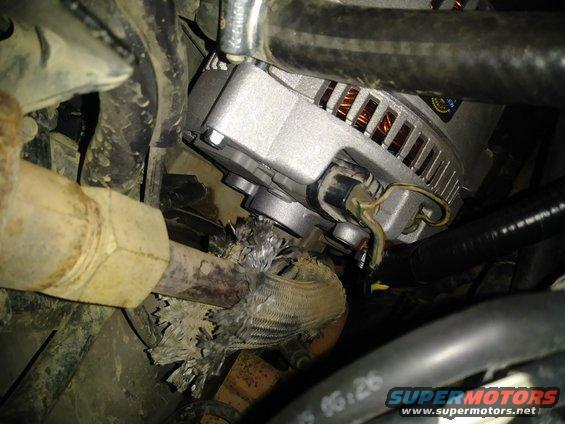 also luckily, i've been sitting on a new bosch 130 amp alternator that is listed for a 96 econoline. however, i've not installed it because i wanted to upgrade the charge cable for it when i install the alternator. i've looked up many threads and saved many diagrams. however, the my 96 seems to be a slightly different beast (or maybe i fail at reading comprehension). 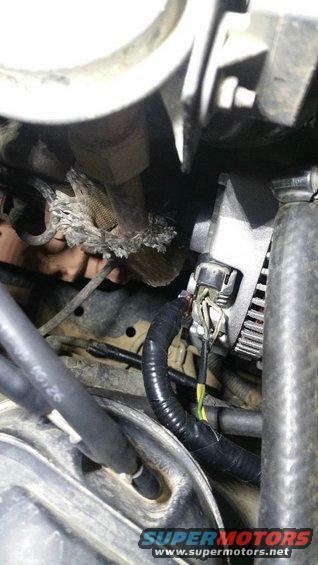 i already had the 3g alternator, so i didn't need any new connectors or anything. however, i had to figure out the wiring. 3 solder slugs, but they didn't actually fit in the ends. they were too big. so i cut them down and ended up using only about half of them. i went with a 4 gauge wire. i estimated i needed about 4 feet of wire to make a nice easy length. i cut off the end that would attach to the battery. here, i goofed on the slack i needed between the charge cable and the plugs. now there is tension on the smaller wires and that's not going to work for me. i went with a 175 amp mega fuse i picked up from an expedition in the junk yard. then i taped it closed. and then it connects to the solenoid. when i saw the connection on the alternator, i new i needed to re-do some of this. so i didn't wrap the rest of the charge cable with wire loom. however, i will. now, for the most part, that's all fine and dandy. but here is my bigger problem. 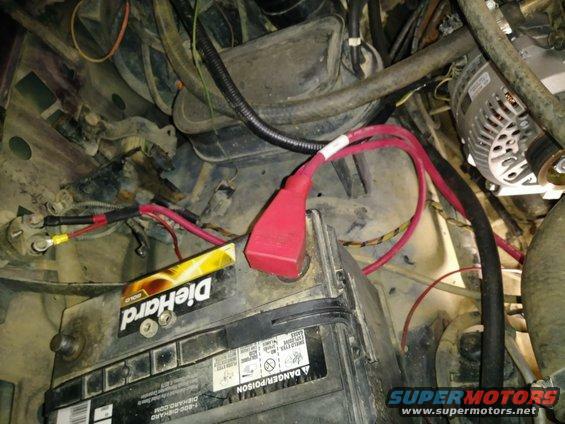 what can i use for a connection to the alternator? my terminal end was so big i had to cut it down to fit into the alternator. i'll add to this that i was pleased to find the alternator bracket did not need to be altered. i saw some threads saying people had to do that. and i also did not need to change my serpentine belt. i feel like i saw that out there, too. this was truly a remove / reinstall job except for the upgraded charge cable. and any additional input is appreciated. 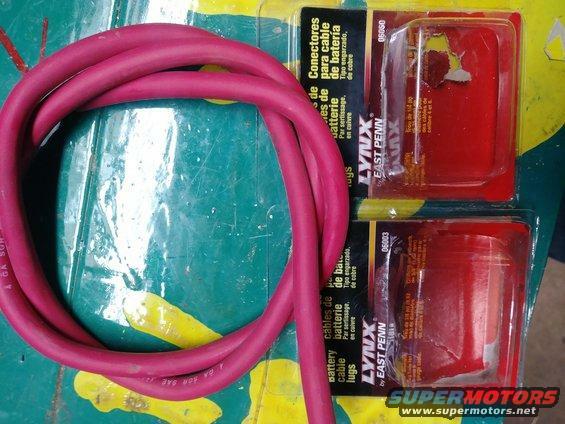 do i need to make a new cable from the solenoid to the battery, too? 96s and all other Aeros do not need to have their brackets altered as they already came with a 3G alternator. Bricknose trucks *do*. They make smaller terminals that attach between the terminal and your wire. 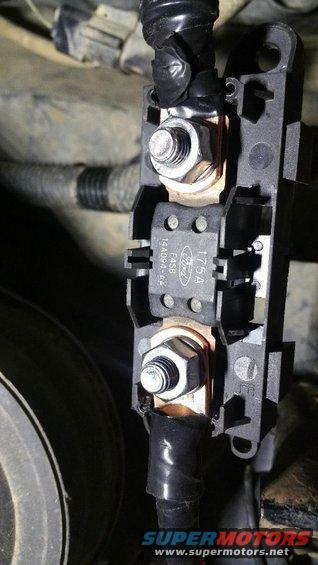 In fact, they make some that let you connect the Ford alternator terminal to a 0 or 00 gauge wire or bigger. 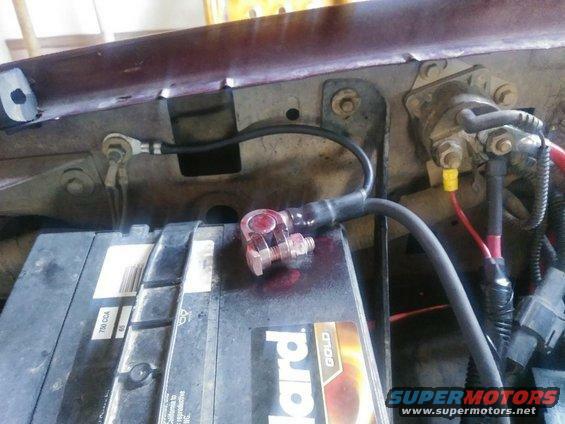 A new battery to solenoid/fuse/whatever cable is rarely a bad idea when upgrading like this. However, it's not strictly necessary. ok, i wasn't sure about the bracket. the needs for the upgrades seem so varied. plus, it's hard to decipher when someone is going just from a 3g 95 to a 3g 130+ or going from a 2g alternator to 3g high output. i knew i needed the mega fuse. i also was pretty confident i could retain the factory routing, although some prefer to route the bigger cables differently. i just want to make sure i didn't miss something crucial and run the risk of melting something. i'll get the solenoid to battery replaced soon, too. any suggestions on where to get the proper terminals? i asked the guy at napa but this was all they had...according to him. Car stereo shops. 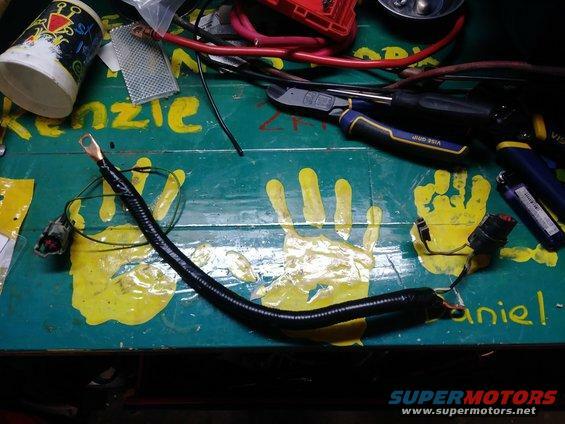 They routinely build bigger cables for stereo installs. NAPA et al only are interested in stock replacements. 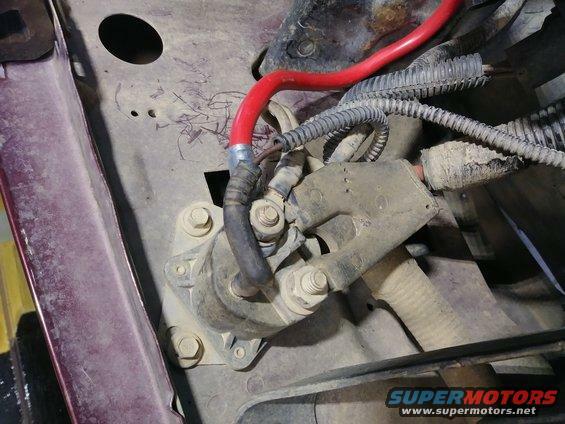 When I did mine, I installed a fender-mounted megafuse holder and ran the alternator output cable to it, then had a short cable coming off the megafuse going to the solenoid. Remybattery.com has a lot of different connectors. I don't think you are going to find one small enough to fit in that plastic shroud on your alt. 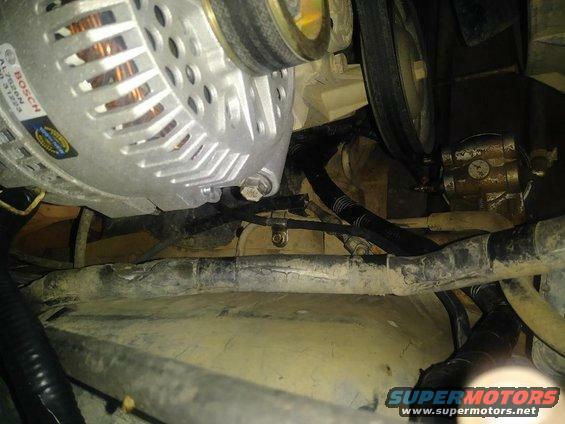 I installed a fender-mounted megafuse holder and ran the alternator output cable to it, then had a short cable coming off the megafuse going to the solenoid. that's exactly what i was going for but, like i said, blew it on the cable measurements. when i re-do it, that's what i'm going to do. I don't think you are going to find one small enough to fit in that plastic shroud on your alt. so what do people do when they build new cables? cut the shroud? surely there's something better than that. I used a charge cable off of an Expedition, it's a big cable(4ga maybe ,see pic) and has the small eye terminal that fits in that shroud. 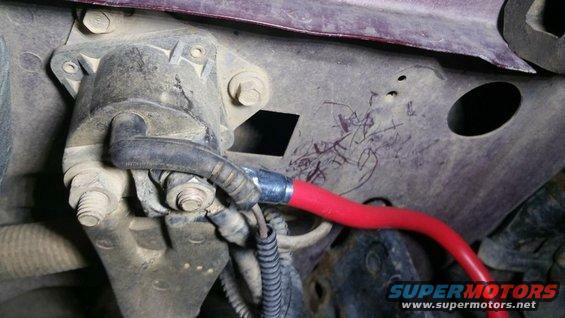 I also use an adapter that gets the cable out from behind the alt, think I got that off of an Expedition as well but other Fords use them. well that makes me feel better. i've seen posts where people used wire even thicker than 4 gauge and it seemed excessive. but, that's not a big deal. i just want to make sure i don't burn down the bronco b/c i installed a wire before finishing some research. now, i'm sitting here wondering why i didn't do this two years ago. Deleted.... Go to my Thread "I made the Switch from 95 to 130." since i upgraded the alternator i replaced the charge cable. i still need to rework some of that wiring, but i haven't gotten to that yet. however, i also decided to replace the battery cables. 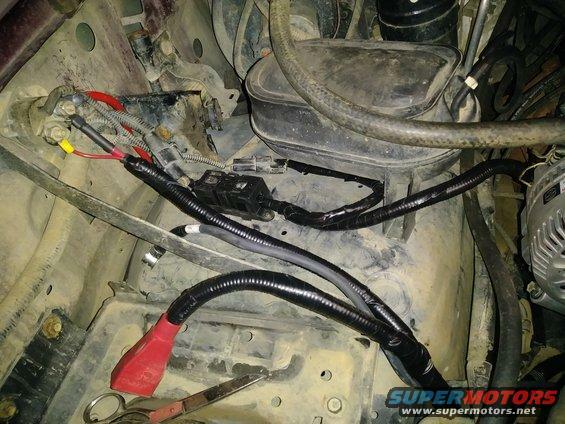 i found that SMP makes a pretty nice charge and ground cable, so i ordered them from rock auto. i believe these are the same as the ones offered by napa, but these were significantly less than the napa offering. i'll also note that while these are 4 gauge, and the charge cable from napa is also 4ga, these cables are noticeably more flexible and the jacket seems better. i'll start with the ground cable. i was a little confused by it. 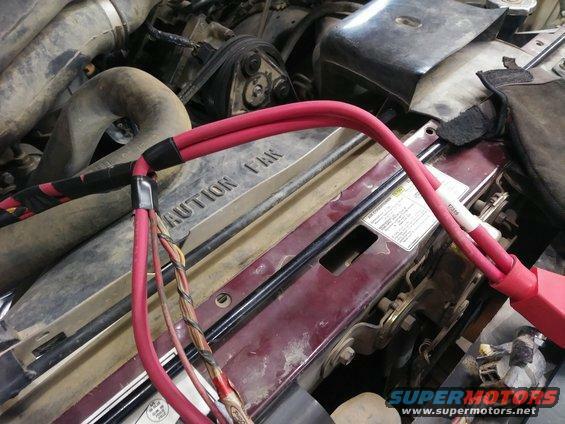 the oem cable would mount to the frame before going over to the engine. 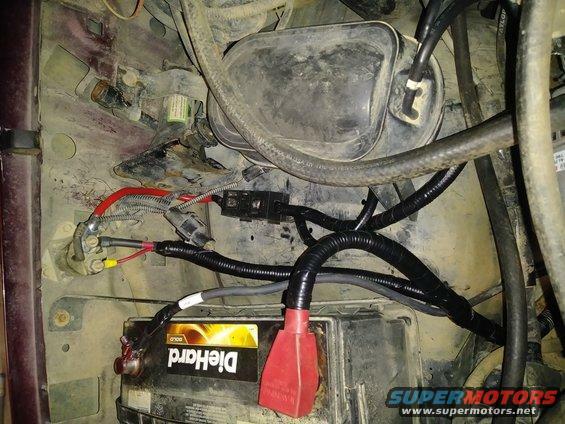 the new cable goes straight from the battery to the engine. no a huge deal, but it's not exactly what i hoped for. 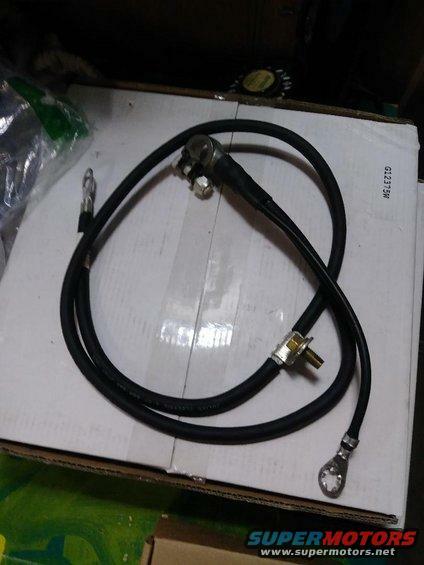 if you order a generic 40" top post cable you should probably be fine. on to the positive cable, i pulled the entire cable and unwrapped all the cables that were bundled together. i forgot to take a picture of the second set of cables that are bundled with the battery cables in the loom together. however, when i had to wrap them back together, i started at the starter. i connected the to cables to the starter plus the cable for the o2 sensor. then i taped them together. 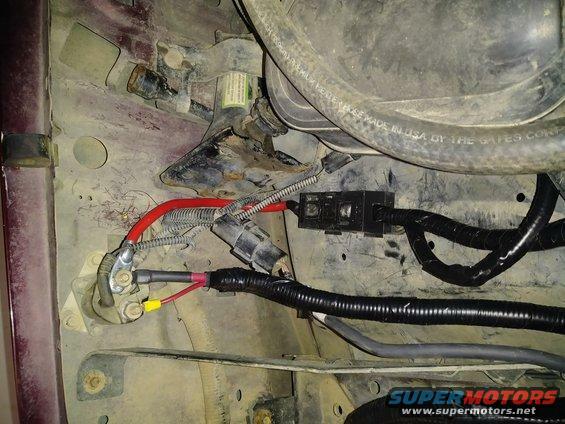 i didn't get a pic, but i had to cut off the smaller wire that goes to the starter and connect it to the auxiliary wire that comes with the replacement cable. from there, i worked my way back up toward the battery. 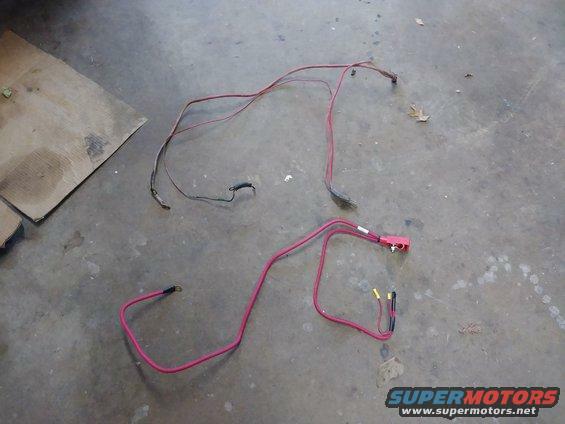 the second wire harness connects to the o2 sensor, some plug under the alternator, and then another plug near the solenoid. 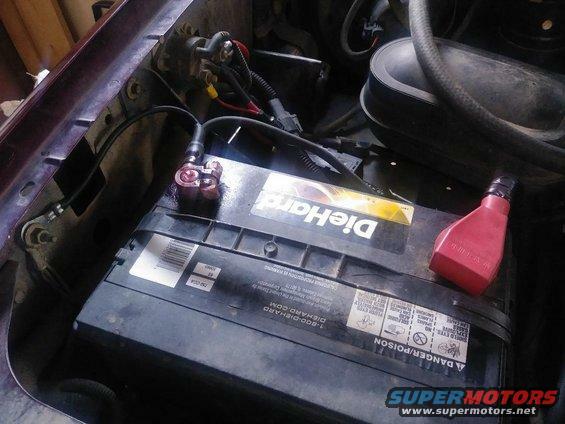 when it comes up from the starter, it jumps over from the battery to starter cable and then goes over to the battery to solenoid cable. so i just followed the natural bends in the wiring to determine where to make that switch. and then i wrapped up with tape. unfortunately, i ran out of electrical tape and i need to replace some of the plastic loom. so i'll have to resupply and then finish the job. however, i was able to get it hooked up and everything started up just fine. glad you figured something out that works. i know im a little late to the party but ill leave this for posterity. 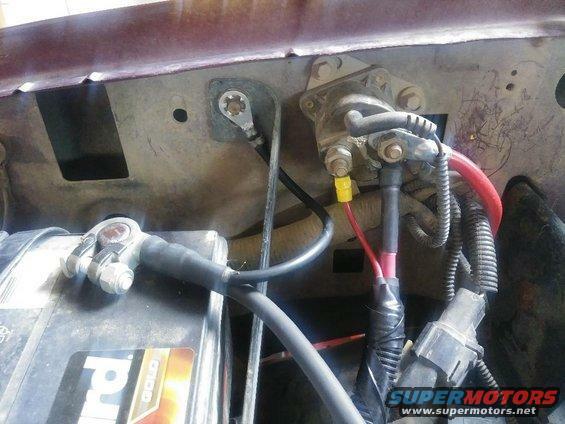 the solenoid needs a 5/16" ring terminal. the alternator stud looks much smaller, though im not sure exactly what size. i know the pre-made universal type cables from advance use a 3/8" stud which is much too large for either, though you can make it work. on mine i used the pre-made advance cables. i had to cut off one side of the plastic shroud. i used a pair of wire cutters so i wouldnt accidentally damage the stud. i also had to use a cutoff wheel to shorten the ring terminal on the end that attached to the fuse holder, it stuck out too far. 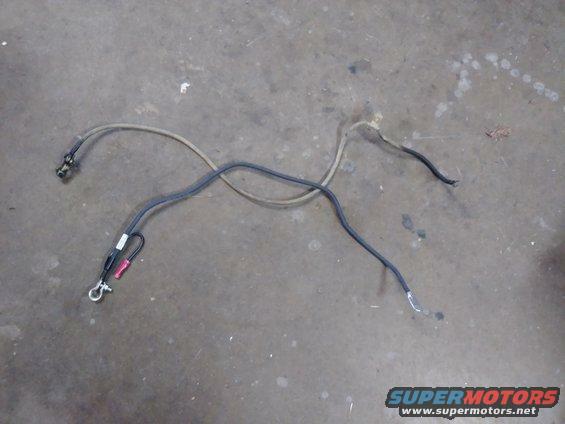 i dont remember if i had to modify the cable end that went to the alternator or not. 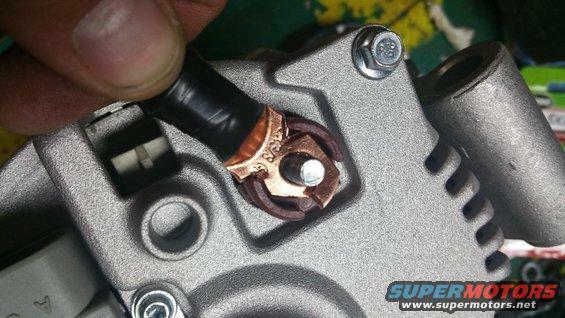 you'll need these ^ for the solenoid side and probably the fuse holder side also. you should also be able to make these work on the alternator stud, though a smaller size would probably work better. 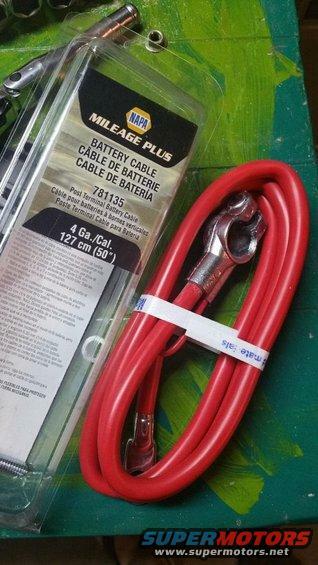 im not sure if these would need trimming like the pre-made advance cables did. not exactly sure what you might need the 3/8" lugs as they are bigger than necessary for the solenoid. 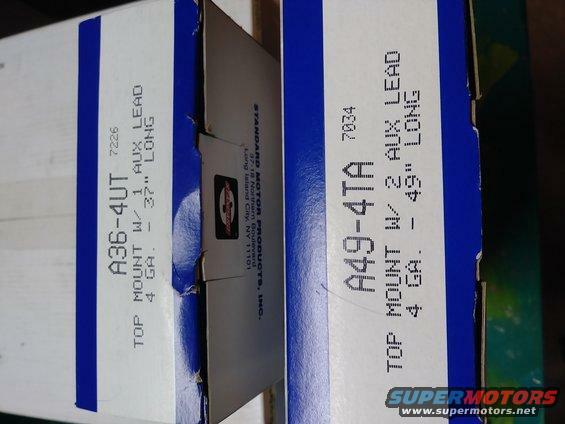 again, you could use these but i would much prefer to use the 5/16" lugs unless you have an aftermarket fuse holder that requires using the larger lugs. i thought i'd list them here because someone else might find them useful. you could probably find similar products with more variety of sizes and at a cheaper price on amazon or another large online retailer. as far as the small extra ground wire on the terminal on your pre-made stock style cables, iirc, both my 87 and 89 have a small 2 wire connector that comes out in between the battery and radiator. as best as i can tell this is a ground for the computer and should be connected to the negative battery terminal or other extremely good ground. they may have wired other years differently though. well hopefully this is the end of my adventures with these battery cables. i took advantage of the 20% off at napa on the 2nd saturday of the month (didn't make it to the early bird 30% before 9am) and picked up some more cable ends and cable. then on my way home i swung by pep boys b/c napa didn't have exactly what i wanted. pep boys had what i needed. in the end this is what i should have bought to begin with on this charging cable. i picked up more electrical tape and some 1/2" wire loom from harbor freight. then i loomed & taped just about everything. you can see how much further the alternator pigtail hangs off the end of the cable compared to the original charge cable i did. i screwed the fuse box to the fender well. 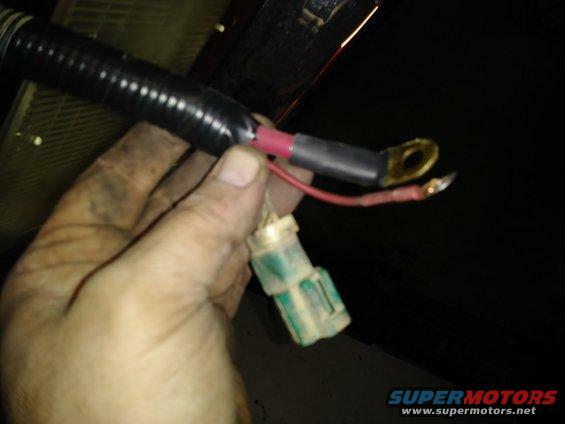 and i reused the fuse-to-solenoid cable i made last time around b/c there was no need to change it. Another alternative would be welding cable, which is really flexible and can carry large loads with a higher strand count and a really nice durable jacket. I did basically the same thing you are doing but with 2/0 welding cable and rarely ever see any voltage drop even on large loads. A work around mounting would be using the right angle adapter pictured up the thread and break off the tabs to mount the larger lug. sharpshooter109 and dash_cam like this. well hopefully this is the end of my adventures with these battery cables. ahahaha...if it was only so easy. i found out after i completed this that the factory negative cable was still available. on top of that, there was a need for that auxiliary connector at the negative connection. go figure. so, having knowingly given up one ground connection already (at the frame as the SMP cable didn't have one) and realizing that had actually gone from 3 to 1 connection, i decided i needed to get an OEM cable. luckily for me, i found a "USED" oem cable (P/N WC8980) on amazon for $10 shipped. when it came, it was just loose in a bag, but was uninstalled. i looked at mounting the auxiliary ground on the brace for the battery tray, but i'd have to sand off a bunch of paint to get a decent ground. even though i would have preferred the least bit of extra slack on this, i decided to use the factory location. oddly, there was a nut there already. 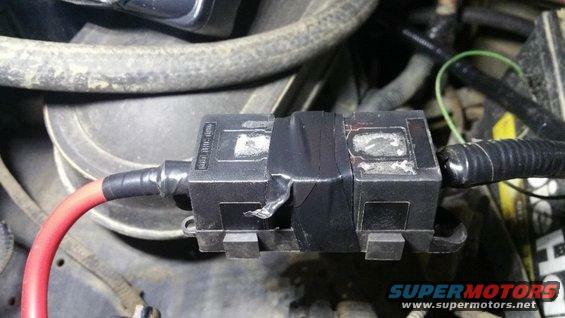 i can only assume it was because the PO put it there when removing the negative cable previously. if you squint, you can see the nice new ground connection on the frame. i hate to say i'm done b/c i don't want to jinx myself. but...i sure hope not to work on this anymore. looks good. When I did mine, all sorts of things started working differently. Like for the first time, I had a clicking sound when the turn signal was on. And the seat belt chime started working. It also started instantly. 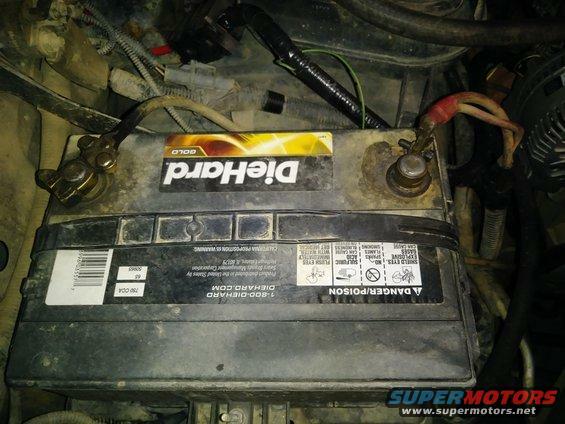 great find on that negative battery cable. I need the same myself as it is in very poor shape. the positive side is a bit easier to cobble together. So, even though the part #WC8980 shows as not fitting my 1993 via Amazon's search/verification system, there were no problems? I'm assuming Amazon's part fitment verification isn't working properly? Thoughts? amazon is pretty good at only showing things that fit. i've seen things that do fit show not to fit. so, it may both fit and still show that it doesn't. also, no negative battery cable is listed for my 96 351 but this worked perfectly. csilvestri and TravisITGuy like this. Would there be any issue if the green wire is in the same wire loom as the charge cable? Not sure if them touching would cause any issue, I ran 4ga charge cable with the stock green wire within the loom. Sorry for digging up old thread. I'm no expert, but I can't imagine there'd be a problem. It's not like the spark plugs where there could be interference.